One struggle most teenage girls have in common is their weight. The pressures to be thin, gorgeous, and wealthy cause major stress in daily life. This ideal body image is not for everyone, but rather to remain fit and healthy. Diet decisions made within the teenage years form a pathway that gets used throughout a person's entire life. A healthy lifestyle leads to a better complexion, an upbeat attitude, and a longer life expectancy. Now there is a way to develop healthy eating habits besides going on those painful diets and over exercising. 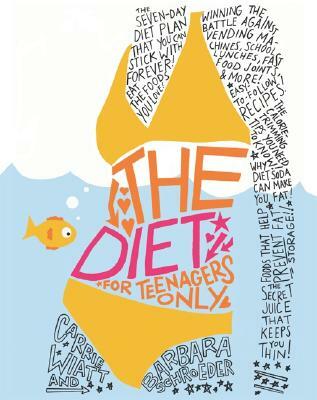 The book The Diet for Teenagers Only by Carrie Wiatt and Barbara Schroeder teaches girls to eat right, promoting physical, emotional, and mental well being. Topics discussed in the book range from diet myths, including restricting certain food leads to weight loss, and tools to calculate whether you are at a healthy weight. A food plan contains vital information on counting calories, sugar, and other important ingredients. Ever wanted to know what those complicated food labels actually mean? You'll learn how to interpret them, and compare healthy choices. The authors clearly write to educate young adults on the dangers of improper eating, and how to fix such habits. I read this book from cover to cover and found some very interesting information. For teenagers a healthy BMI, or body mass index, ranges from 19-22. To calculate your BMI, divide your weight in pounds by your height in inches. Then take this number and divide by your height in inches. Finally, multiply that by 703, and you've got your BMI number, hopefully in the healthy weight range. Also included are delicious low-calorie recipes from chocolate chip bars to macaroni and cheese. The Diet for Teenagers Only may be found at most major bookstores for $18.95. Or check out eBay, Amazon.com, or your local library. Happy reading!